Hotel near Stratford High Street DLR Station. 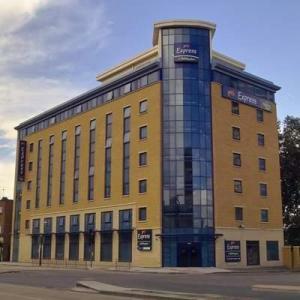 Either you're staying in Stratford for business or leisure, Holiday Inn Express London-Stratford is the place to be, thanks to its excellent links for transport. The hotel was built in 2002 and offers many facilities to those who are in London for a deserved vacation or to do business. The hotel is within a 7 minute walking distance from bus and train terminal station Stratford, home of the channel tunnel. The hotel has 153 rooms and has been recently refurbished. Convenient services include an express check-in/check-out feature and a luggage storage area. In addition, the multilingual staff will be happy to offer local tips, ensuring a pleasant stay in London. Holiday Inn Express is a brief walk from ArcelorMittal Orbit and Westfield Stratford City. London Aquatics Centre and Olympic Stadium are a short drive away. The hospitality and welcome from our staff makes you feel immediately at home, as soon as you walk through the door, either if it is your first or fiftieth time. For more information, please contact the hotel directly and we'll be pleased to help in anything you need. The hotel's parking lot has limited spaces, so we advise you to book in advance- do it so through the hotel. 6 Double Bedded rooms (specifically adapted for clients with disabilities. The hotel has 46 Twin rooms. 31 are non smoking and 21 are smoking rooms. Smoking rooms are limited to floors 5 & 6 while the non-smoking rooms are located between floors 1 to 4. Interconnecting rooms ( to rooms with double beds) are also available and can be booked on request. Additional charge is applicable. No Room service is available. The hotel has 62 double rooms. 41 are non smoking and 21 are smoking rooms. Smoking rooms are limited to floors 5 & 6 while the non-smoking rooms are located between floors 1 to 4. These rooms can accommodate up to a maximum of three adults or two adults and two children. The spacious sofa in the room can be used to accommodate the third adult or the two children. Interconnecting rooms ( to twin bedded rooms) are also available and can be booked on request. Additional charge is applicable. No Room service is available. From outside M25, on approach to M25, follow signs for Stansted Airport until J28. Join the A12 at J28 bound for Blackwall Tunnel. Turn into Stratford A118. On taking the slip road off the A12, at the roundabout take first exit left onto High Street A118. Hotel is approximately 1 mile on the left at the Junction of Carpenters Road. From M11 or A406 North East, take A12 - Central London. From M2 (A2)/M20(A20) take Blackwall Tunnel to A12 then A11 (Direction Stratford A118). At Bow Interchange take first exit left onto High Street A118. Hotel is approximately 1 mile on the left at the Junction of Carpenters Road. Start out going east on Aaron hill road, turn onto County road. Enter next roundabout and take 1st exit onto Alpine Way. Turn right onto Woolwich Manor Way/A117 and turn slight left onto ramp to merge with A13. Turn slight right onto ramp to merge onto Blackwall Tunnel Northern Approach/A12. Turn slight left onto Bow Interchange and enter next roundabout and take 3rd exit onto High Street A118. Travelling time approx. 11 minutes. Central Line, Jubilee Line, Docklands Light Rail, Silverlink trains and ONE trains all stop at Stratford Station. Buses: Bus no. 25 is a 24 hour bus service between Central and East London. Stops are located within 20 metres from Hotel.